It wasn't until recently I started thinking on this subject again. Even though the functionality serves its purpose I wasn't entirely happy with the way it worked. The form element that is used to interact with the serialized predicates feels a bit clunky. And then there is the limitation of two operands (user rights) per operator. This makes it all somewhat harder to use, especially with more elaborate predicates. It did prove, however, to be an excellent starting point for a somewhat more elegant solution. This does not say the arity needs to be fixed, it just needs to be known. The easiest way to accomplish that is to simply tell the operator on how many operands it should be applied to. The AND operator now operates on three items (either operators or operands) instead of two. The OR operator still operates on two items, but that number is no longer set in stone. The NOT operator still operates on exactly one item. It would also make no sense to have AND and OR operators act upon a single item. So it might be wise to keep in mind that some restrictions still may apply. We set the arity of the operator by adding a numerical suffix that indicates the number of operators and operands that operator should act upon. We also need some kind of symbol to separate the two. For this purpose we use a colon ( : ). All operators need to take this approach since the arity is no longer bound by the type of operator. Even for the NOT operand this kind of makes sense (even though the count will always be one) because that way we can use the same approach for all operators which is more efficient when identifying an operator token. Before we (re)create, along other functionality, a function for evaluating this new expression format against a set of granted rights it is very important to keep performance in mind. It is also very important to ensure that we do not try to evaluate incorrect or illegal formats. However, this syntactical and semantical validation check does not have to take place each time we try to evaluate an expression. As before, as long as we validate the expression somewhere before we start using it we are good. A good moment to validate an expression would be before storing it alongside the resource we are trying to protect. This will push somewhat more elaborate (and more expensive) checks out of the code that needs to stay lean and mean in order to keep evaluation as fast as possible. So we are back where we started with our evaluation function. First we will just lay out the code, and then explain what's what. Note that isAllowed() still operates under the assumption that $expression is a valid serialized expression. The isAllowed() function is roughly the same as before, the only thing that changed is the appearance of the operator token which now consists of an operator symbol and a count part. Also, instead of a fixed number we pop $count items from the stack and process these, depending on the operator, in the switch-statement to calculate the intermediate boolean result to put back on the stack. Finally, as before, we return the single remaining value on the stack. A decent amount of consideration, mainly concerning performance, led to this semi final form. Semi, because I am still tinkering with it :). Decisions were mainly based on some quick benchmarks, so results may vary on different systems. Because the AND and OR operators can now take any number of arguments (at least two) the calculation of the end result has slightly changed. At first, this appeared hard but in practise it proved really simple. We can even use some lazy evaluation. We will discuss both snippets in turn. When we evaluate a set of booleans that use the AND operator, all booleans must be true for the result to be true. This could be compared to the universal quantifier ∀. If we find a member that is false we are done. We both terminate the foreach loop and further execution of the case statement with break 2;. Otherwise, when all items have been traversed, this means all members were true and this is the only case where the end result is actually true. This could be compared to the existential comparison ∃. As soon as we find a member that is true, we are done. Once again we terminate the foreach loop and further execution of the case statement with break 2;. If we traversed all items and found nothing, the end result will be false. In this variant we have done away with the $args helper array. This should result in less writes and with it a (albeit slight) speed increase. Note that in this variant we cannot break early because $stack still needs to be reduced a specific amount of items (the arity of the operator). The only real difference is that the calculation of the end result was done on the fly. Let's test this functionality using our previous example. It might be worthwhile to make a truth table to keep track of what outcome calls to isAllowed() should have with different combinations of granted rights. We use some rights combinations to test this functionality. We are back to the actual hard part: building a new expression in a user friendly way. This time around I tried to create a form element where a user only has to do some (or maybe a lot) of clicking. We make use of jQuery (built with version 3.3.1, not really tested for backwards compatibility but it should be fine) for some DOM-management. The same principle is applied as before: we edit a bulleted list and put the resulting serialized expression in a hidden input field. The functionality is also once again set up such that you can easily reuse the code to quickly create multiple form elements. In a similar fashion you can create as many Rights elements as you like. Because the expressions are more flexible than before, there is also a lot more that can go wrong. It is for this reason we make our validation function more verbose. Besides checking validity of the expression it will try and do its best to point the user towards any errors that may occur. Obviously, the people using this functionality need to have some understanding of how this works to be able to use these form elements. Note that both isOperator() and isRight() only check if the format of the associated tokens is correct, but not explicitly if the values (operator symbols and right ids) are valid. 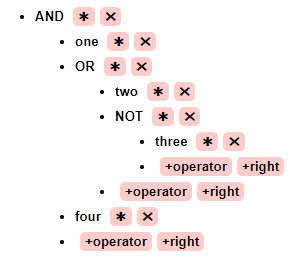 So these are lenient rudimentary checks to help determine whether the expression is syntactically valid, or at least, "good enough" to build or continue building the tree. The operator symbols and optionally specific right ids are of course explicitly checked at some point. The validate() function is split into two parts. First of all a syntactical pass is performed. This is to ensure that the expression is at least syntactically correct so we are able to render a correct, albeit perhaps incomplete, tree. Any errors will break off further execution of the function. This is done because once an error of this kind is detected this means the expression is invalid and beyond repairing. This also means it can no longer be guaranteed the tree can be rendered correctly. Passing this part of the validation still does not guarantee a valid expression, but it at least is an expression we can work with. The second part performs a semantical pass. Here we finalize all the checks to guarantee we are dealing with a valid expression. If we have gotten past the first part this means we are at least dealing with a syntactically correct, but perhaps incomplete, expression. So in that sense, there is no real need to halt on the first encountered error. Rather, we can validate the entire expression and return all errors we come across. This further enables the user to fix all remaining semantical errors in one go. Finally, when no errors occurred, the valid key will be set to true. If the valid index of the returned array is false this means the expression is invalid. In this case the expression should not be used to evaluate user rights. It is also strongly discouraged to somehow store invalid expressions. Ideally you should always establish the expression is valid before passing it to isAllowed(). As pointed out before isAllowed() operates under the assumption the expression is valid. If you try to evaluate a malformed expression there is no telling what will happen. Worst case isAllowed() will return true when it really, really shouldn't. If the valid index is false the returned array will also come with a syntaxErrors and errors index. The syntaxErrors index contains a boolean indicating whether syntactical errors occurred. This also functions as a handbrake before rendering the tree. The errors index will contain an array with one or more key-value pairs of a token index (if applicable) mapped to the error that occurred on that index. It is probably best that you make sure that when you store an expression, it is valid. Then, when you edit it again it will render correctly. Ultimately, we want to (re)create a MySQL FUNCTION that determines if someone, given a serialized list of rights, is allowed access to a resource warded off by expression. Easily obtaining debugging feedback from a FUNCTION is kind of impossible. So, for the creation and debugging we use a PROCEDURE instead. This will enable us continuous and direct insight about the internal state and will in turn enable us to properly and easily develop and debug SQL code. Because, you know, you kinda want to make sure this code is pretty much flawless. Note that I am using somewhat longer right ids (above 9) to test in MySQL. This is because when you apply REVERSE() to a string, it reverses everything, including the numbers of the right ids, as opposed to array_reverse() in PHP which only reverses the order of its members. Many changes in printing and validating the expression; these are mostly concerning a smoother user experience and better error feedback. made the demo more interactive (with validation feedback), go give it a spin!